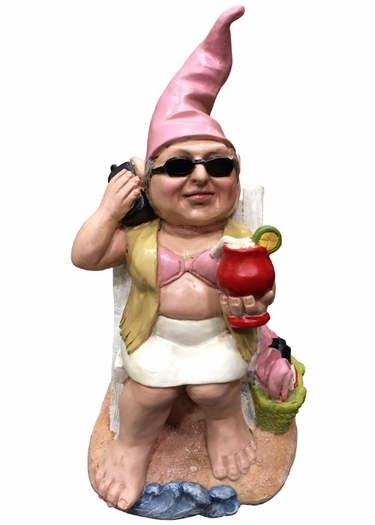 Nobody enjoys a fabulous vacation on the beach like our newest relaxing Beach Girl Gnome! Leaning back in her beach chair with toes in the sand, she sips her margarita in one hand, as she chats on the cellphone with her girlfriends. A purse on the side holds her wallet, pink flip flops, and water bottle. This Beach Girl Gnome has so much detailed design she will blow you away! Our new Beach Gnome Collection is already a hit, and will look great in any garden, beach house, by the pool, or any other fun place you need a little vacationing atmosphere.